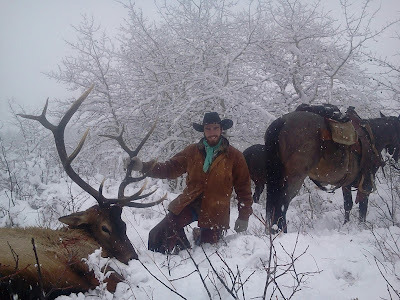 Like most hunters, this hunt for me didn’t just start on opening day but instead it started months earlier when I found out I drew out on the late bull elk hunt in my area. This hunt is a pretty rare one to draw out on and is often a “hit or miss” opportunity depending on the weather. The fortunate part for me was that I spent most of the summer working up around the area I was going to be hunting so I was able to get to know some of the area pretty well. When hunting season came around I was getting excited and nervous hearing about everyone’s success or failures while I waited patiently for the general season to end so that my late season hunt could begin! It was a cold foggy morning with 6 inches of snow on the ground when I had the opportunity to get to the mountains. As my friend and I hit the saddle we knew it was going to be a cold wet day as it had already dumped about 7 inches of snow the day before while continuing to snow. Without being able to see more than 100 yards ahead we decided to travel as slow and silent as we could on horseback. As we made it half way up the mountain we spotted a herd of elk! My heart was racing as I tried to make out the distinction of the silhouettes walking through the storm. Once we were able to get our optics to focus in on the herd of elk we saw that this herd was full of cows and a few smaller bulls, but nothing we were looking for so we continued up the mountain. My heart rate still hadn’t returned to its normal pace by the time we were sneaking through a nice draw when all of a sudden we spotted a nice bull making its way across a clearing. By this time my heart felt like it was stuck in my throat stopping me from breathing. I reached for my gun and before I knew it I was off my horse with a 6 bull centered in my cross hairs. As I watched him in my scope he was standing broadside looking at me just like I had been dreaming about for 5 months since I drew out on this tag. The bull turned his head to run but I wasn’t about to let this opportunity pass me by, there was no way I was even going to give this guy the chance of getting away. Just as I pulled the trigger and saw his body buckle underneath him as he hit the ground. 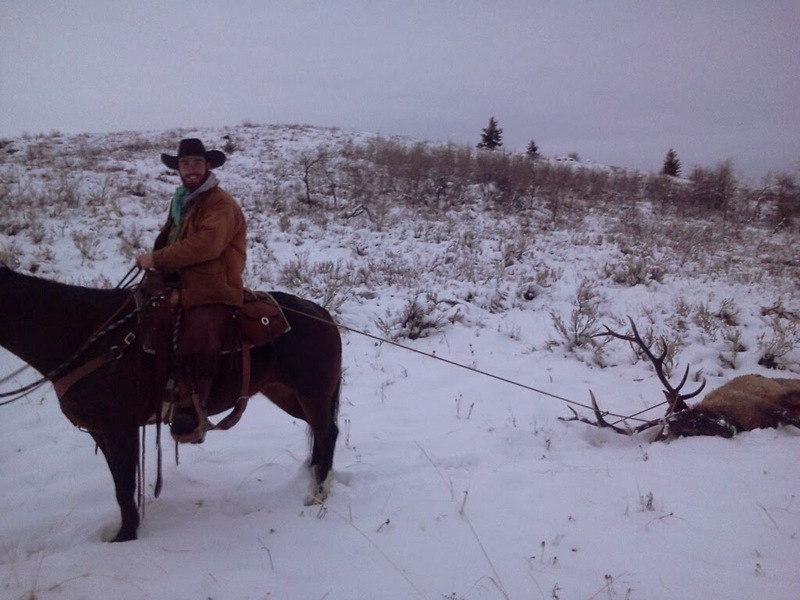 When I pulled the trigger, my horse spooked and took off running about 40 yards away then slowed down… My friend and I got my horse and then waited about 15 minutes before going up to the elk. The feeling I got when I walked up to my elk was just the way I had hoped I would feel when I first drew this tag. I didn’t want to settle for a small bull when I knew what I potentially could put my tag on in this area. We celebrated for a good while before field dressed him and figuring out how to get him out of there. The snow turning into being a blessing in disguise allowing me to drag this guy out behind my horse. It was easy going for the most part except for when we would have to tie up the horses and drag him through the random rock piles. When we finally got to the trailer we were exhausted from all of the work and excitement but knew that all of our efforts had paid off exactly the way we had hoped they would! So I have been thinking non-stop about ice-fishing lately. Some people think ice-fishing is crazy and stupid but I absolutely love it! One reason I love it so much is because in my area I am able to use up to 5 poles per person while ice-fishing which can make for a very exciting time when the fish are really biting! Without going on and on about lots of the other reasons why I love ice-fishing I want to share with you my top 3 items that I feel are essential to ice-fishing! I know there are plenty of times that I take my ice shelter and do not use it, but I can't express how essential one is when you do need it! It is like the common saying that you never realize how much you need something until you don't have it... Even on the days when it is good weather and great fishing it is good to have the shelter set up and a place to keep your gear. I have used the shelter to not only keep me warm on the freezing cold bad weather days, but I have also used it to keep me from getting sun-burnt on the clear calm days sitting on a snow covered frozen lake which refects the sun rays no matter what direction you turn! A shelter can also be used to dry out wet clothing if you have a heater or some other heat source inside. If this contraption is legal in your state then get one!!! Honestly it has been a blast using this product and I have zero complaints about it! For those who don't know what the JawJacker is, it is an ice-fishing pole holder which holds your pole bent down and then releases the tip of the pole when a fish bites your bait... this release allows the bent pole to straighten out and set the hook for you resulting in more hook-ups when ice-fishing. I wrote a post review about this product last year and if you want to read more about it be sure to check it out here. I will be posting videos of me using this product this year and hopefully get some footage of me pulling out some great fish. This product is great as a pole holder if you are able to fish with more than one pole. I know some people who use these on all of their poles while I myself like to use them on a few while jigging the others. As basic as this item is, you can never leave home without it! I am also realizing now that it is better if you get a bigger sled than you need so that when you take extra people with you or extra gear you don't have to small of a sled!!! My dad is always giving me a bad time because I convinced him that I only needed a small sled for ice-fishing and now I am always asking him if I can borrow his bigger sled... I have seen people build their own as well as build a 2 story sled which is like having a sled with an upper shelf. Have something unique which makes you stand out! I have a hat my wife bought me when she was in Russia a few years ago... This hat has now become my favorite/lucky ice-fishing hat! Things like this just add to the fun and craziness that often goes on while ice-fishing... Like I mentioned earlier some people think I'm crazy because I love to sit on a frozen lake and try to pull fish through a hole. 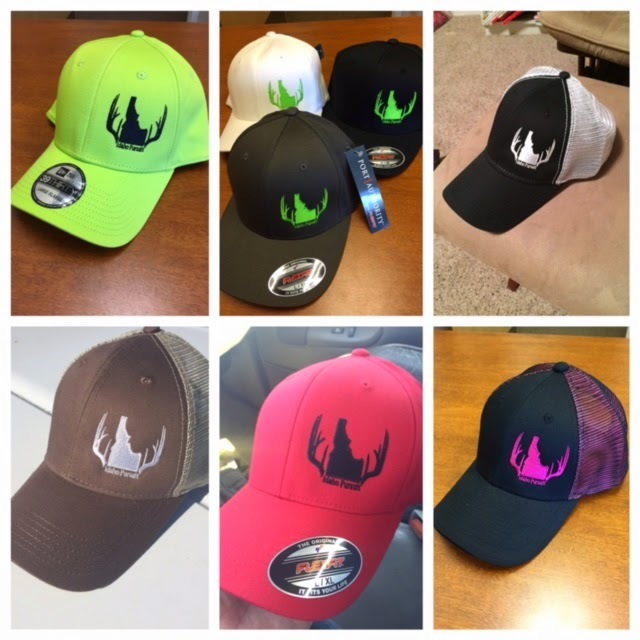 This hat just keeps those rumors and people talking :) Make it fun! This post is not aimed at any one group of outdoors enthusiasts but rather as a general suggestion for any of us who may travel to an area other than our own to hunt or fish. I am very fortunate with where I live. I am surrounded by wonderful hunting opportunities including elk, deer, moose, as well as small game and bird hunting also. I am also smack dab in the middle of some of the countries greatest fishing/fly-fishing locations that are available. To put it lightly I would say that where I live could be considers an outdoors paradise to some. With that said, it is not uncommon for me to run into a few other outdoors men while I'm hunting or fishing who share the same passion for the sport as I do. As much as I wish I could be the only person who knew about some of my favorite hunting or fishing spots, I am a realist in the fact that I understand my desire is not reality. When sharing with those I encounter on the mountain or at the lake/river, sad to say I am often appalled at how rude and inconsiderate some individuals can be. The following is not a set of rules we need to follow but rather they are suggestions that I feel could make everyone's experience better when encountering someone in "your spot". As upset as you are it is a key principle to remember that we are all human, make mistakes, and are not perfect. Even if you think the person who is in your spot is doing it just to piss you off, chances are they have the same motivation you do which is to enjoy the outdoors. On the other hand if you see someone fishing or hunting in an area you were wanting to be, do not be immature and ruin their experience just because you are jealous or upset that they are "in your spot". I have had my share of ignorant people attempt to ruin my experience by yelling while I'm sneaking up on an animal, circle their boat over top of my fishing lines, paddle their float tube right through my fishing lines, or purposely spook an animal just because they were jealous I had the opportunity they were wanting. Respect them as a person and do not ruin their experience. This includes respecting their space. If you are wanting to hunt or fish in that spot don't just assume its public access and you can go as close to their party as you want. Yes legally that would be okay but out of respect for them it would at least be nice to ask them if they would mind or if they would be upset if you hunted/fished next to them. My worst example of this is fishing Henry's Lake in the fall. If one person catches a fish it seems to attract every boat and float tube around who feel the only fish in the whole lake must be right under that person's boat... Respect the other person's space and don't be entitled to believe you are the only one who deserves to have success. This is one I feel very passionate about and am sad to see happen in any location. No matter if it is right in your back yard or if you're clear across the world, respecting the land is a principle that needs to be followed. As I mentioned earlier I would love it if I was the only person who knew about some of the hunting and fishing spots I enjoy, but reality is that I'm not. As upset as I could be when I find someone in my spot, it upsets me so much more when I get into that location to see that the person who was there last treated the spot will little or no respect. I have picked up bags and bags of garbage other sportsmen have left behind and am just shocked to see how some of them destroy the natural landmarks (trees, rock formations, and other items) with little or no thought of those who may be there next. When people treat an area as if it is dispensable, replaceable, or of little or no worth I often wonder why they were there in the first place. I was taught by my father to not only take care of an area but to try and leave it in a better condition than how you found it. If all sportsmen lived by this principle we could all enjoy these "spots" a lot more than what we already do. When hunting or fishing in an area, especially when traveling far distances, there is always a sense of pressure to not come home empty handed. Not only do people not want to go home empty handed, but they also want to come back with a trophy. While this may be our goal/desire at times, if that is the only reason we are out we may just want to stay at home. It is not bad to have this goal/desire if we truly respect the wildlife we are after. I know of a few fisherman who are so controlling about their spot that they keep every fish they catch to ensure that no one else will catch that fish there. These fisherman have wasted fish at times because they keep more than what they can eat. I have also heard of hunters leaving animals in the woods because they weren't "big enough" or cutting off antlers and leaving the rest of the animal because they only cared about the horns. Hearing a hunter say something like, "yeah we gave up lookin for it because it just wasn't worth it" is poison to my ears. No matter what terrain, what species, or gender the animal is, it is worth your effort to do all in your power to recover than animal. I have found two quotes/sayings that have really summed up my opinion on this principle and here they are. These three simple principles are standards which can and should be followed to not only make your experience in the outdoors better but also the experience of everyone else who may follow behind you. No one wants to go outdoors for a relaxing hunting or fishing trip and deal with some person who is rude, ignorant, or immature. Respect the land, the people, and the wildlife no matter where you are, especially when hunting out of state or out of your original area. Remember we are all guests in every area we hunt or fish. It is not our own and we have been blessed to enjoy it for the time being. Being an outdoors men goes deeper than filling tags and filling the freezer, its about conservation, management, and friendship. The outdoors is supposed to teach young men and women about respect, hard work, dedication, and other wonderful concepts yet fails to do so when bombarded with the irrational actions of those less observant of these principles.